The operating principle of a bridge crane is as easy to grasp as a coffee mug. They pick stuff up and move it somewhere else. For someone who does a lot of writing about a lot of different kinds of industrial products and processes, it’s refreshing to be assigned a topic whose conceptual complexity is roughly equivalent to that of a hammer. Hammers hammer. Hoists hoist. Bridge cranes lift. Workstation crane image courtesy of Gorbel.  In addition to the fact that they’re easy to understand, bridge cranes are highly visible in the contexts in which they’re applied, so it’s easy to discern the different purposes for which they’re used. If you conduct a Google search of the term “bridge cranes,” you’ll see a handful of fellows holding remote controls that control the movement of a bridge crane through a warehouse space, in which cases the cranes are used to move heavy objects in storage or heavy objects during assembly of something. You’ll see other examples of much larger bridge cranes being used to load cargo onto ships; you’ll see other examples of models that are used to move shipping containers. The common theme of each of these images is that bridge cranes are used to move things that would be too heavy or too large for people to move manually. Bridge crane image courtesy of Brehob. 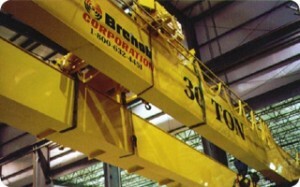 So what distinguishes a bridge crane from other crane or hoist varieties? If you were asked to visualize a crane, what image would come to your mind? Even though I’ve had bridge cranes on the brain all morning, I still associate the word “crane” more with the image of construction cranes or jib cranes than I do with bridges or gantries. I imagine the kind of cranes you see dotting cityscapes – the ones with the tall towers and the single, counterweighted arm. Why is this? They are called “cranes,” after all, and the utilities’ resemblance to fowl of the family Gruidae is the likely explanation of the name’s etymology. Bridge cranes probably came to be named through the same mechanism. In the same way that non-bridge cranes’ name evokes birds with craning necks, bridge cranes came to be named in a way that evoked their architecture. They look like bridges. They feature struts that support a bridge suspended over something, and the area over which the bridge is suspended is the range of the crane’s operation. 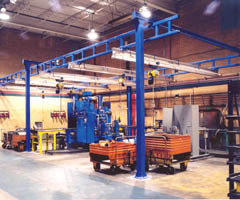 This arrangement is perfect for warehouse applications because the struts can be installed near the walls of the facility (or they can be integrated into them), and the main moving part of the crane, the bridge, can move freely about the upper reaches of the facility without interfering with the goings-on of the floor below. The bridge of a bridge crane is equipped with two main sets of moving parts. On either end of the bridge can be found the mechanisms that allow the bridge to move back and forth on the rails on which it’s installed. So, for example, if you’re imagining a long room, imagine that above you, mounted on struts, there are rails that run parallel to each other, away from you. The bridge would be mounted perpendicular to those parallel rails, and could slide towards you and away from you on those rails. Then, mounted on the bridge itself, the hoist is installed. This hoist can slide left and right along the bridge, and it can raise and lower a winch, which is the part of the crane that actually comes into contact with the objects that the crane is used to move. As you can imagine, bridge cranes are valued in industrial facilities because they’re unobtrusive and can access any object placed between the rails on which the bridge is mounted. There do exist some bridge crane varieties that feature only bi-directional transporting (as opposed to four-axis transporting), and these may be used in smaller facilities. Bridge cranes are satisfyingly simple and indisputably important. Without them, many of our manufacturing processes would be impossible. Our shipping infrastructure would implode. Workplace related injuries would increase exponentially. Luckily, we have access to this simple, effective tool.